The University of Washington is a big place. Before setting out, we encourage you to find your destination on our campus map and plan your route. You can also get help at one of our five gatehouses. If you are planning to park on campus, please allow at least 30 minutes to purchase a parking permit, park your car and walk to your destination. 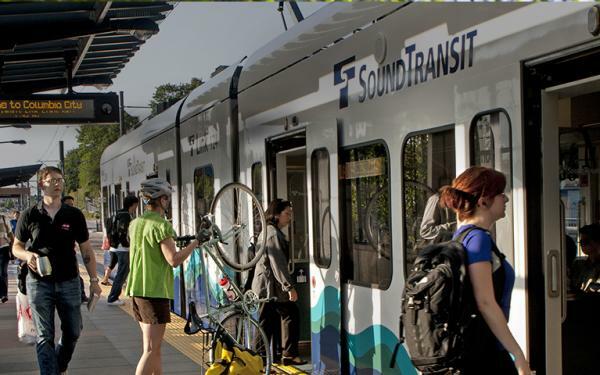 In many cases, it may be easier for you to arrive by bus or light rail. We can help you plan your commute by transit, carpool/vanpool, walking, biking. Information about making deliveries or dropping someone off can be found here. Information about accessible entrances and facilities can be found at our Access Guide. Always take it slow when driving on campus. Most roads have a 20 mph speed limit and are shared with bicyclists and buses, as well as the thousands of students walking across them daily. Popular locations on the central campus include the Visitors Center, Meany Theater, Suzzallo and Allen Libraries, Kane Hall, Henry Art Gallery, the HUB and the UW Club. The Visitors Center is located on the first floor of the Odegaard Undergraduate Library. If you have an Event Parking Permit for Meany Theater, head north on 15th Ave and turn right at NE 40th St where the West Gatehouse is located. You will be directed to a specific level of the Central Plaza Garage. North campus includes Hughes Penthouse Theater, the Burke Museum, the School of Law and the Foster School of Business. From I-5 southbound, take the NE 45th St exit (#169). Turn left onto NE 45th St. Continue east about one half mile to Memorial Way NE. Turn right onto the main campus. Stop at the North Gatehouse for directions and a parking permit. From I-5 northbound, take the NE 45th St exit (#169). Turn right onto NE 45th St. Continue east about one half mile to Memorial Way NE. Turn right onto the main campus. Stop at the North Gatehouse for directions and a parking permit. From the east use State Route 520 and take the Montlake Blvd exit. Continue north past Husky Stadium. When the road splits, take the left fork onto 25th Ave NE. At the traffic light, turn left onto Pend Oreille Rd NE. Stop at the East Gatehouse located up the hill for directions and a parking permit. Northeast campus residence halls include McMahon, Hansee, Haggett, Madrona, McCarty and Willow. The latter three are the newest additions to north campus. From I-5 southbound, take the NE 45th St exit (#169). Turn left onto NE 45th St. Continue east about one quarter mile to Memorial Way NE. Turn right onto the main campus. Stop at the North Gatehouse and tell the traffic guide which residence hall you are going to. You will be issued a parking permit and given directions to the closest available parking area. From I-5 northbound, take the NE 45th St exit (#169). Turn right onto NE 45th St. Continue east about one quarter mile to Memorial Way NE. Turn right onto the main campus. Stop at the North Gatehouse and tell the traffic guide which residence hall you are going to. You will be issued a parking permit and given directions to the closest available parking area. Use State Route 520 and take the Montlake Blvd exit, bearing right onto Montlake Blvd. Continue north past Husky Stadium. When the road splits, take the left fork onto 25th Ave NE. At the traffic light, turn left onto Pend Oreille Rd NE and stop at the East Gatehouse. Tell the traffic guide which residence hall you are going to; you will be issued a parking permit and given directions to the closest available parking area. West campus residence halls include Alder, Elm, Lander, Terry, Maple, and Poplar. Apartments in west campus include Cedar Apartments, Mercer Court, Steven’s Court and the Commodore Duchess. From I-5 southbound, take the NE 45th St exit (#169). Turn left onto NE 45th St. Continue east about one quarter mile to 15th Ave NE and turn right. Head south on 15th Ave and turn left at NE 40th St. Stop at the West Gatehouse and tell the traffic guide which residence hall you are going to; you will be issued a parking permit and given directions to the closest available parking area. Depending on your destination and space availability, you may need to walk several blocks. From I-5 northbound, take the NE 45th St exit (#169). Turn right onto NE 45th St and continue east about one quarter mile to 15th Ave NE and turn right. Head south on 15th Ave to NE 40th St and turn left. Stop at the West Gatehouse and tell the traffic guide which residence hall you are going to; you will be issued a parking permit and given directions to the closest available parking area. Depending on your destination and space availability, you may need to walk several blocks from your assigned parking area to your destination. Use State Route 520 and take the Montlake Blvd exit. Continue north on Montlake Blvd, bearing right onto Montlake Blvd. At the first traffic light after the bridge turn left onto NE Pacific St. Proceed west on NE Pacific to 15th Ave NE. Turn right and head north on 15th Ave to NE 40th St. Turn right and stop at the West Gatehouse. Tell the traffic guide which residence hall you are going to; you will be issued a parking permit and given directions to the closest available parking area. Depending on your destination and space availability, you may need to walk several blocks from your assigned parking area to your destination.